Good morning everyone! Everyone had a fantastic day today! We had a great day at Ohana! When we arrived at school we were greeted by our teacher’s smiles and hugs. Our teachers were already playing music and we walked right in to dance and sing! But first, we had to make sure to do our morning jobs and take care of our responsibilities before we got busy playing. When we were done with sorting out our things for the day we were free to play! On the table we had the connecting people and connecting disks to play with. Our friends and Chiaki found an interesting way to play with the disks. They put the disk on their eyes and may colorful silly glasses. We tried out many different combinations and tried to find the one that we liked. Out in the library corner, John was reading us books and close by in the carpet area Nimo was playing his violin and his ukulele. 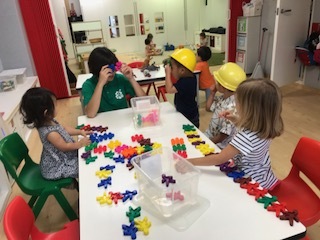 Our friends packed away the blocks that was out and instead decided to pull out the musical instruments and decided to play along with our teachers. After our morning music session we went and had our snack for our next activity for the day. Our teachers were watching the weather forecast like a hawk all morning and were very wary of the possible thunderstorm that was supposedly going to come around at noon time. Our teachers ended up deciding not to do the pool just incase and just have a early water play time out in our classroom balcony. We got changed into our swim wear and headed out to the balcony, there we found a water tub full of water and colored balls. We had a great time splashing our friends and tossing the balls all over the place. Our teachers brought us cups to play with and of all things the most entertaining thing that we thought up was to grab a cup full of water and dump it on our own heads. We have gotten so used to the water and we love getting wet. We couldn’t dunk our heads into the water tub so we were glad our teachers got the cups for us so we could get wet from head to toe! After our awesome water tub play we got dried up with the help of our teachers and changed into our dry clothes and headed over to the carpet area for circle time. We got into a circle and sang a lot more songs with Nimo. We helped Nimo count how many buds friends we had this morning, he asked U to count she courageously stood up, but then was a little bit shy to be all alone. O stood up to take her hand help U complete the task at hand. With a little help from her friend O, U was able to finish counting all of our friends in the classroom. Nimo then asked the class how many teachers were in the classroom today L, A, and B raised their hands and started counting. Our final task was to count all of the people inside the classroom. Counting up to ten was not a problem but past ten we still need a little help. So we all worked together as a class and we counted all the way up to eleven! Tomorrow our class will be a little bigger so we will learn how to count even higher. After our counting session we had a little music lesson with Nimo. He got the bells we had in the classroom that we all so love, but little did we know the bells, had the sound of Do-re-mi! We all sang along with the bells and worked on how to sing do, re, mi, fa, and sol on pitch! We are looking forward for another day at Ohana tomorrow!